When it comes to washing clothes, you’ve got the basics down pat. But some items come out of nowhere, screaming for special attention. And those strange symbols on wash tags? Get a hieroglyphics translator on the phone. That’s why we created The Never-Fail Washing Guide. It’s everything you need to know about items that require a more personal touch. The machine wash symbol is well-known amongst laundry aficionados. It’s the extra symbols below it that throw people off. One bar stands for a permanent press option (a warm wash best for wrinkle-free clothing), while two bars means the garment is telling you to try a little tenderness. In other words, go for the delicate cycle. When it comes to signs, triangles are synonymous with warnings, road hazards and safety messages. But not with your laundry? The triangle means bleach can be used. An X through the triangle? That means bleach is a no-go. 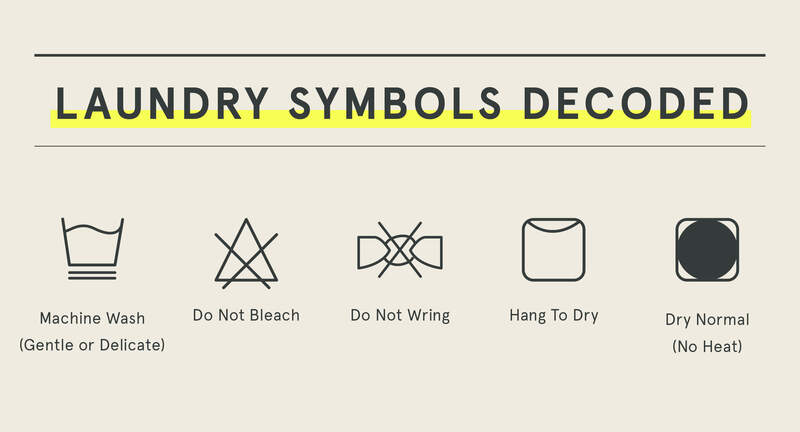 You might think this symbol warns you against washing your garment with bow ties, because you know, bow ties wreak havoc inside washing machines. But not to worry. This symbol simply asks you not to squeeze or twist your garment after washing, even if you’re angry at it. Okay, okay. The laundry world knows full well that hanging someone out to dry is not kind. But it does make for a good way to remember what this symbol means. So if you see it, know that your garment has been fully-trained to not feel abandoned while drying on a clothes line. Symbols referencing your dryer reflect the shape of a dryer—a square box with a circular opening does the trick. Dots inside the circle refer to the amount of heat you’ll use. One dot means use low temperature while two dots give you the OK to dry at normal temps. But sometimes, your breathable garment just wants some fresh cool air. Yellow pit stains? No, you can’t erase them with whitening strips. But when you do see that stain starting to manifest, don’t get sentimental. Even if the bond between you and the shirt is strong, it’s best to just break off the relationship and dump it. Having holes in the toes is an obvious indicator for throwing out your socks. But when your socks start losing their hold on the ankle? That’s the first clear sign of sock impairment. A loss of elasticity—it’s the real reason why socks go to heaven. When do your crisp-looking chinos need to get tossed? When their color starts to fade. But don’t let their comfort fool you. Faded chinos are bad for business, and make for lousy impressions. Didn’t follow these washing instructions? Don’t worry. Replace something by getting in touch with a Stylist.